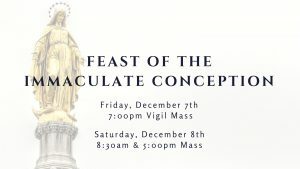 Saturday, December 8th is the Feast of the Immaculate Conception and a Holy Day of Obligation. We will be celebrating Mass on Friday evening and Saturday morning. We look forward to celebrating Mass with you!